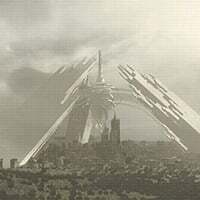 Tower System Outline is one of the information archives in Nier: Automata. The tower facility processes and computerizes resources sent by resource-recovery units for use in its launch device. Made up of 256 stratum, it can filiter and compress information with a turbidity of less than 2,300 and have it recorded into the payload in approximately 27 minutes and 32 seconds*. Details regarding routes required for the disgestion of androids are recorded separately.